Our approach is to work with our clients, not just for them, to achieve outstanding project outcomes. We always aim to exceed the project objectives and expected project benefits. Our close working relationships with clients and their stakeholders delivers efficiency in terms of communication, decision-making, knowledge and skill exchange, as well as the management of the project objectives, timeframe and resources. Our teams are selected specifically to complement the skills and roles of each client’s internal team. Capital Insight differentiates itself by bringing a ‘thinking’ approach to projects by recognising that, for our clients, the design and build process is both a catalyst for change (to achieve broader objectives) and a significant investment (with potentially significant risks). At the core of our approach, is an emphasis on continual consideration of communications, change, risk and value management. Click below to see more. planning efficiency and effective risk management effectiveness leading to reduced costs. 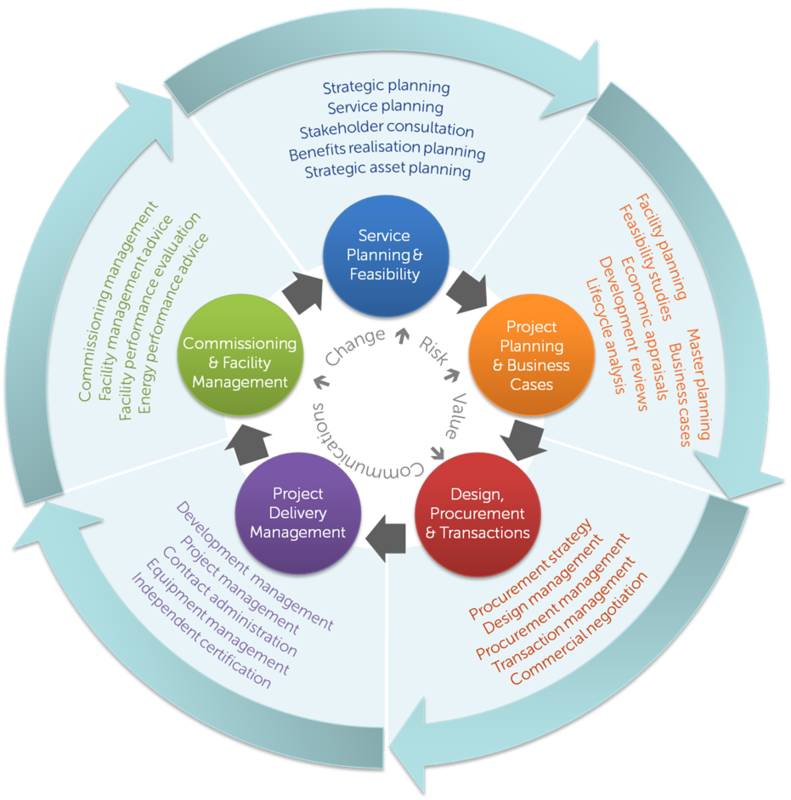 We achieve these aims through a dynamic stakeholder management plan to manage information sharing and decision making. Our staff have extensive experience in managing governance and multiple stakeholders, including facilitating workshops and forums. They have been commended by numerous clients for their ability to communicate effectively, and to harness stakeholder ideas into pragmatic solutions. New projects create a catalyst for operational/cultural change, or support a ‘planned’ change. 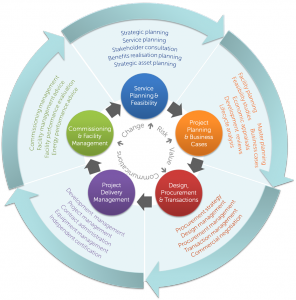 We help our clients to define and implement successful and lasting change programs that integrate with the planning, delivery and commissioning of their projects. We start by confirming the organisational objectives and anticipated benefits and then designing a process to side-step entrenched thinking. This is followed by working with stakeholders to document the current and future state, and then defining the changes needed to realise the benefits. Client leadership, recognition of the impacts on staff, effective communication, a comprehensive strategy to support implementation, are fundamental to successful change management. Our experience covers clinical change, organisational restructuring, technical upheaval and operational commissioning programs. Risk management is a fundamental aspect of every Capital Insight engagement. Our structured approach aligns with AS/NZS ISO 31000:2009 – Risk Management, and ensures informed decision-making with respect to any particular project risk profile. We focus on risk management by allocating risk appropriately, and then reducing the likelihood and impact of losses. Capital Insight’s project managers are coached in the process of risk management and are assisted by our in house risk practitioners, who are accredited as Certified Practising Risk Managers with the Risk Management Institution of Australasia, a unique qualification amongst our peers in the industry. This combines to provide considerable technical expertise in risk management planning, implementation and operation across: infrastructure, operations, capital works procurement and implementation, valuation of risk in public private partnership projects, and environmental and WHS risk management. sensitivity testing in financial and economic appraisals. Determining the value from a project, and continually seeking to maximise its value is an increasing focus of our clients in a constrained funding environment, and it is a critical responsibility that we specialise in. We ensure the project definition identifies the value creation or benefits, as this sets a benchmark for improvement as the project progresses into design, implementation and operation. Through value engineering processes, value management workshops, and economic assessments we identify and quantify the benefits accruing to clients and the broader community, including valuing social benefits. Once a project is funded, we routinely monitor the realisation of project benefits across the whole life of the project, and have processes for ensuring the project is fit-for-purpose. We employ a risk-weighted allocation of contingency, and protocols for its expenditure, to ensure the best outcome is delivered. Capital Insight’s approach to value management accords with Australian Standard 4183:2007 – Value Management, which enables rapid decision-making to break a problem down to its fundamentals to identify and evaluate different ways of meeting requirements without compromising required levels of quality and performance. Our accredited value management facilitators engage stakeholder groups to make explicit the statements that underpin the value factors, to develop options that meet objectives, and to define criteria by which to compare options.